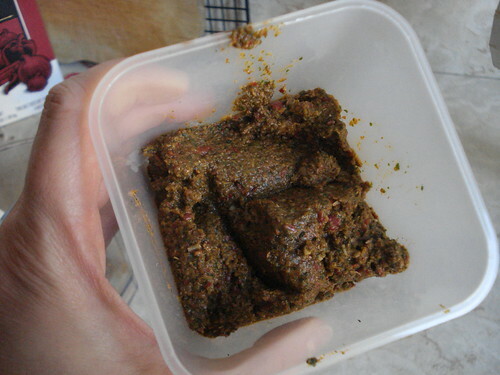 I love Thai food, but I’ve always assumed that it’s difficult to make: so many unusual ingredients, plus the effort of making your own curry paste. I’ve had Real Vegetarian Thai sitting on my shelves for years, and it looks like in that time the only dish we’ve tried is the Pad Thai, which Scott prepared (with the marginal note “double everything”). So with the holiday weekend approaching, I decided it was time to throw a dinner party, invite a few people who haven’t been here for the last few blog efforts, and put together some Thai food. 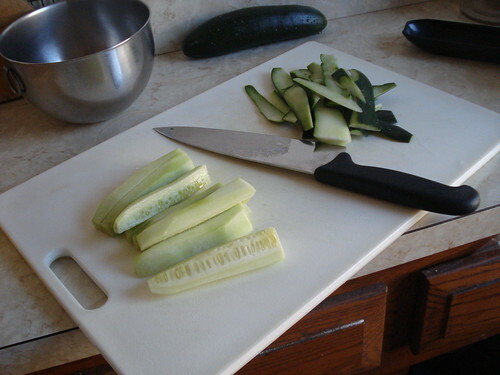 I leafed through the book and decided to make a cucumber salad, a noodle dish, a curry, and dessert. 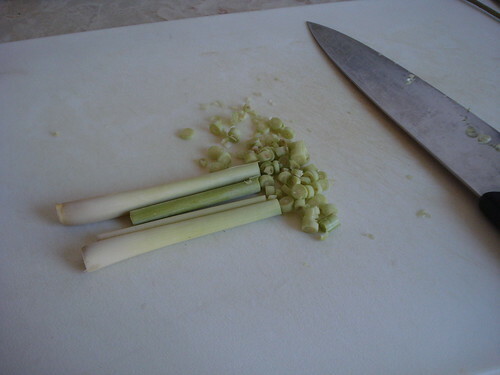 I made a list of ingredients I’d need, and was impressed to find that the only thing I hadn’t found locally before was lemongrass, which would be a base for the curry paste. I canvassed the stores in the neighborhood; no lemongrass. A few shopkeepers said “sometimes we have it, but not now.” I finally found some at an organic store in Park Slope, Brooklyn, that I was passing on my way to do something else, and my shopping list was complete. I began with the coconut ice cream. This is a dairy-free dessert, and very simple: You cook coconut milk with some sugar, then let it cool, then churn the mixture into ice cream. After I’d chilled the mixture I was startled to find that it had separated into thick solid and liquid, but with some effort I was able to break up the solid part enough that it would blend well in the ice cream maker. I set that going and proceeded with my next effort, mussaman curry paste. Curry pastes are the bases for curry sauces in Thai food. The basic ones are green curry, yellow curry, red curry and mussaman; mussaman is basically red curry with some additional spices that import a little more of an Indian flavor, the name deriving from the Muslim traders who brought goods from elsewhere in Asia. 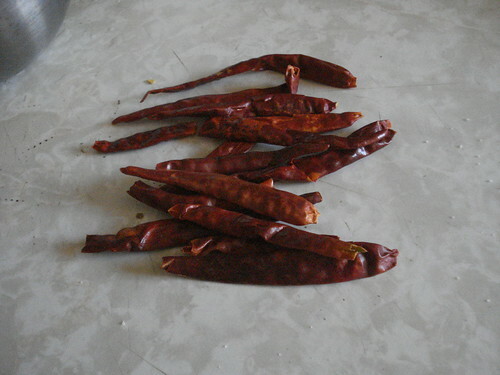 I began by breaking the tops off about 15 red arbol chiles, shaking out as many of the seeds as I could, and then soaking them in hot water for about 20 minutes. 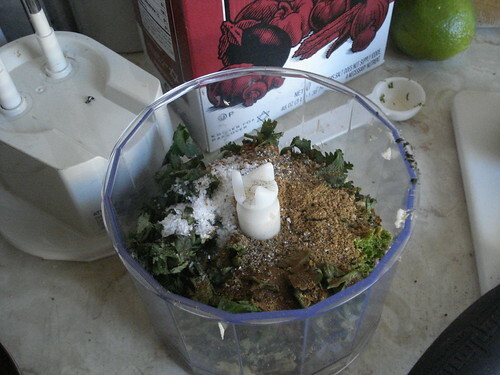 While they soaked, I chopped my lemongrass stalks into small pieces and put them into the bowl of the mini-food-processor attachment for my mixer. To this I added chopped shallot, cilantro, ginger and garlic. 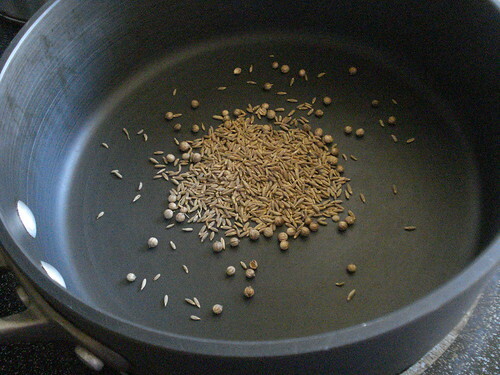 Now it was time to dry-toast some cumin and coriander seeds, then grind them in a spice grinder with some peppercorns. I zested a lime and added that to the mixture, then added some cinnamon, ground cloves, nutmeg, cardamom and salt; these are the spices that make the difference between red curry and mussaman curry. 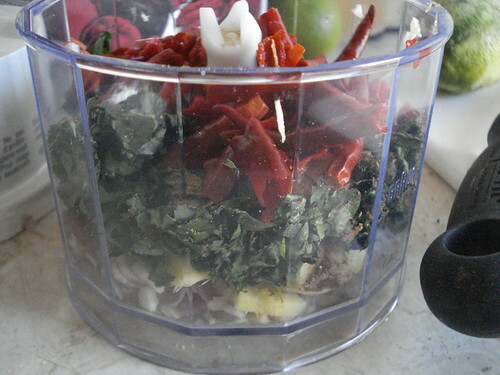 I drained the chiles and added them to the bowl, and pureed it all into a thick paste, adding a bit of water as necessary to keep the blades moving and grinding. I offered it to Scott to smell and he didn’t want to give it back. I put the curry paste into the fridge and prepared the marinade for the cucumber salad: sugar, salt, vinegar and water, boiled together and then allowed to cool. 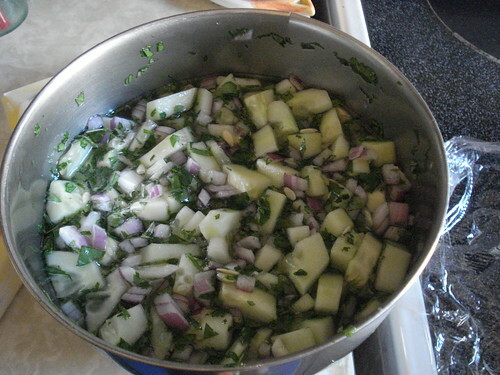 Closer to dinnertime, I peeled and chopped a couple of cucumbers, minced a red onion, and chopped some cilantro, then mixed these together and added the vinegar mixture. The bowl went into the fridge, and I chopped some peanuts and pulled some cilantro leaves to garnish them with just before serving. For the curry I was going to need seitan balls. The cookbook gives a recipe for old-school seitan, mixing a flour paste and then rinsing away the non-gluten part. I don’t have the patience. 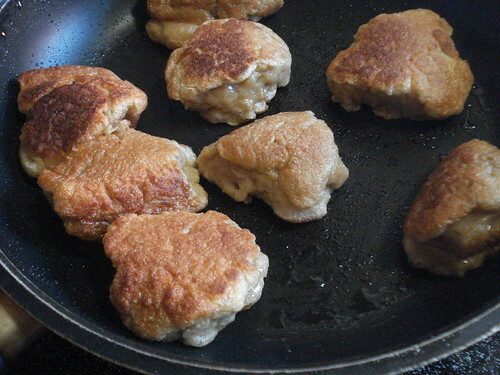 I mixed some vital wheat gluten flour with some nutritional yeast flakes, garlic powder, soy sauce and water, following a recipe I use for my Thanksgiving vegetarian feast; I kneaded the spongy mixture briefly, then shaped it into chunks, and browned them in olive oil. I set them aside. Closer to mealtime I began the other dishes, starting with the mussaman curry. 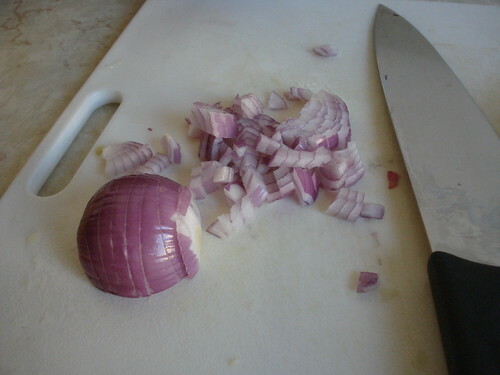 I did my vegetable prep: two diced sweet potatoes, two diced white potatoes, and some chopped onions and garlic. 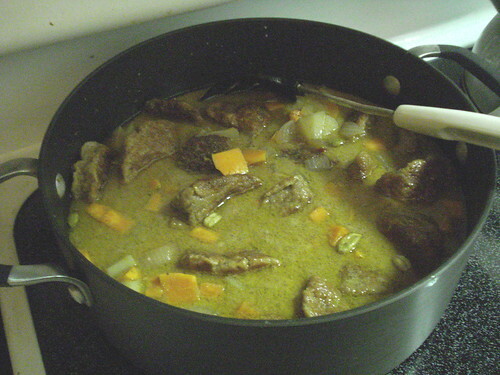 I heated 2/3 cup of coconut milk in my big Calphalon pot; when it was warm I stirred in two tablespoons of the curry paste and cooked it together for a few minutes, then added more coconut milk to total two cans, some vegetable broth, the vegetables and seitan, and some spices including cilantro and cardamom pods. I brought the mixture to a boil and let it simmer for about 15 minutes. Then I stirred in some peanuts and let the mixture sit keeping warm. Technically I was supposed to let it sit 5 minutes, but I forgot to start the rice cooker until it was nearly dinnertime, so I let the curry mixture sit a little longer while the rice finished cooking. We served the curry with rice, and warned guests to be careful about the difference between cardamom pods and peanuts when chewing. The last dish was the noodle dish, which was pretty simple. 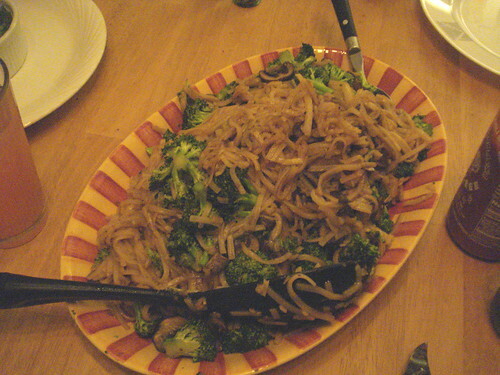 I soaked some dried rice noodles in hot water to reconstitute them; while they soaked I sauteed garlic, mushrooms and broccoli, then set those aside and added fresh oil to the pan. 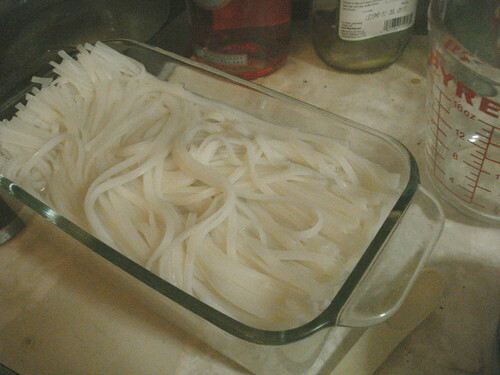 I drained the rice noodles and sauteed them. At this point I was supposed to add beaten eggs and cook them, but one of our guests was a vegan and I decided to just skip the eggs. Once the noodles were sauteed I returned the vegetables to the pan and added a mixture of soy sauce, brown sugar, and vegetable broth, and tossed it all together. 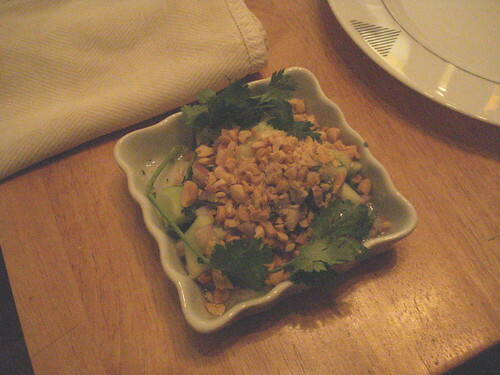 I brought out the cucumber salads first, garnished with peanuts and cilantro, then the noodle dish. The rice was ready about 10 minutes after that, so we brought out the curry and dug in. Everyone loved the food; the noodle dish was especially delightful, and we were all tempted to fill up on it without leaving enough room for curry. But the curry was tremendous. It wasn’t overly spicy, though I think if I made more for just me and Scott I’d add a little more curry paste to the sauce mixture. We ate so eagerly that we were a little worried about having room for dessert, but the coconut ice cream was light and refreshing, a perfect end to the meal. Verdict: Success. I’ll be using the mussaman curry paste again, and making other dishes from this as well. Posted in: 107 Cookbooks, Comprehensive Cookbooks, Entertaining, Vegetarian Cooking.